I've been going through so many jars of PB from baking everything with it. But I'm not complaining! 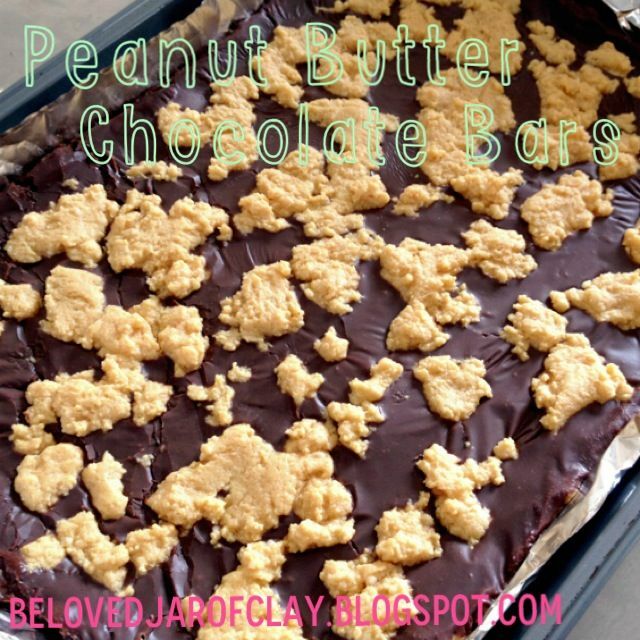 I found this recipe for Peanut Butter Chocolate Bars and it sounded too good and too simple to pass up! And I ended up with a rich and decadent dessert that melts in your mouth and disappears when shared with friends. Preheat oven to 325 degF. Line a 9x13 pan with foil (It saves you from cleaning another dish). 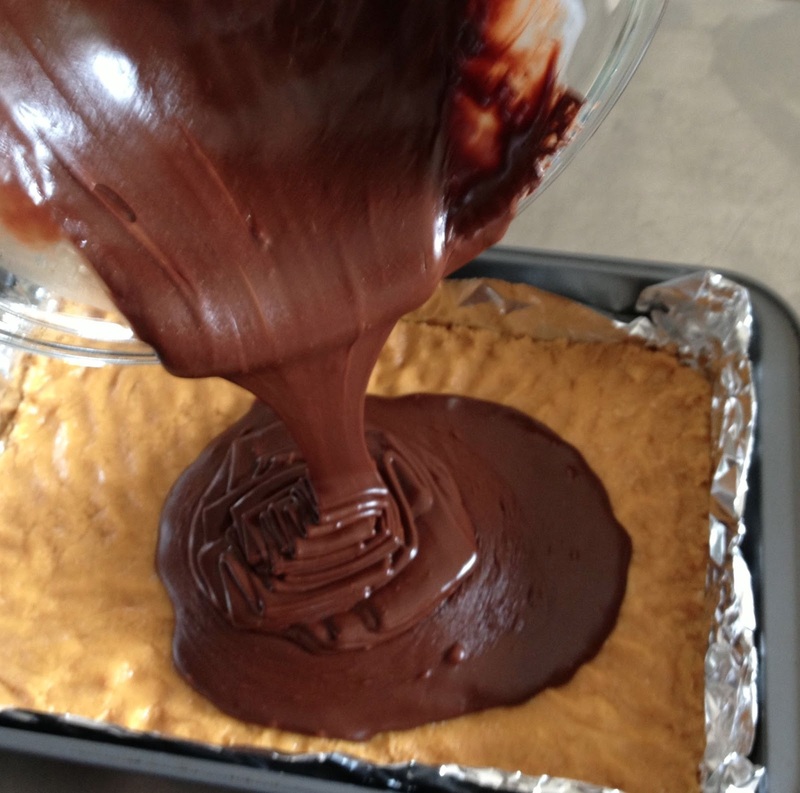 Mix cake mix, melted butter, peanut butter and eggs in a medium bowl using a mixer. Once well incorporated, the mixture will be moist but slightly crumbly. In the prepared pan, use your hands to press 2/3 of the mixture to cover the bottom of the pan. 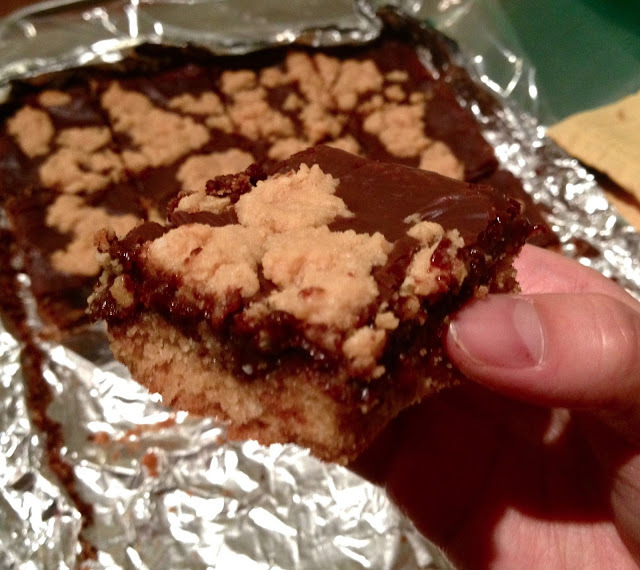 (I worked in the middle and pushed the mixture to the edges). Get the layer as thin as possible, but make sure there aren't any holes. Place the chocolate chips in a medium microwaveable bowl and microwave at 30 second increments, mixing in between, until the chips sweat (get glossy). Add the sweetened condensed milk, vanilla and butter. Mix and microwave again at 15 second increments. Mix in between and microwave until the chocolate fully melts. Pour the chocolate mixture into the pan over the cake mixture. Crumble the remaining cake mixture on top. Bake for 20-25 minutes or until the top is a very light golden brown (Do not let it brown too much). Let it stand and cool completely (2 hours) before cutting it into bars. ENJOY! I hope you try this out!